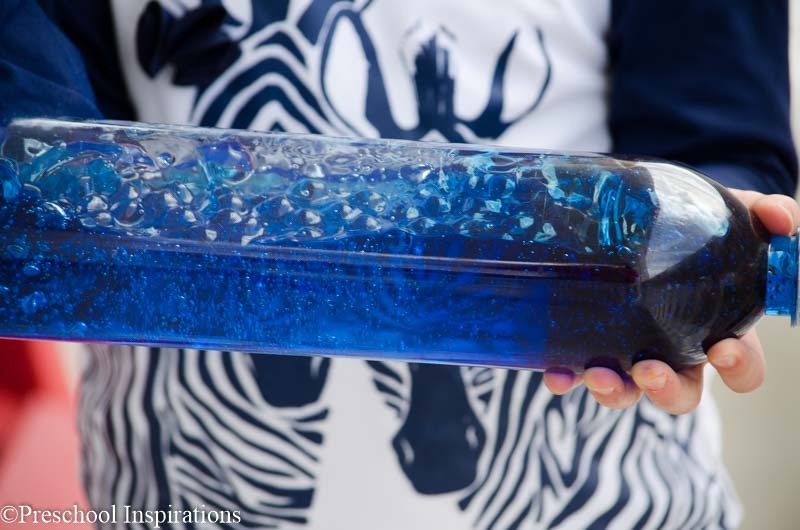 Do you need a great sensory bottle that is super affordable? I’m teaming up with five other bloggers to bring you some super fun and budget-friendly discovery bottles. Here’s the beauty I came up with, and it’s just made of two ingredients from the dollar store with a little pop of color. This post contains affiliate links for products we love and use on a regular basis. 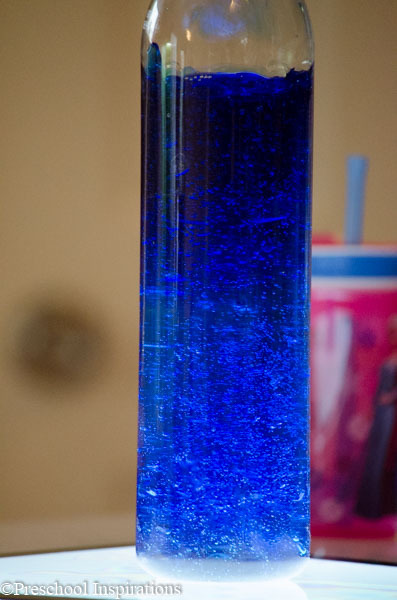 When our discovery bottle is vertical, it just looks like blue goo. Then when we turn it over, it “magically” becomes bubbly and textured. 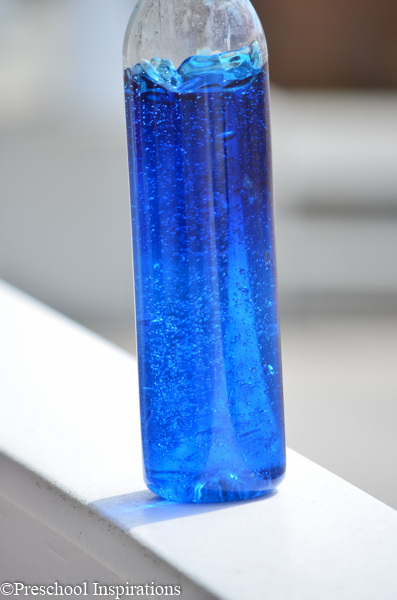 When I made this discovery bottle, I thought I ruined it at first! It appeared that one ingredient “ate” the other. Instead, I have learned that my two ingredients just blend together so well that it looks like there is only one when they are vertical. Then they separate when you turn the bottle. Have you guessed the two ingredients? They are hair gel and clear water beads for the price of $1 each from the Dollar Store. I found the water beads in the floral aisle, but I know that they sell out quickly at some stores, so feel free to make a call before driving to one. If you don’t have a dollar store nearby, or if yours does not carry clear water beads, you can find them on Amazon . To turn the hair gel blue, I added some liquid watercolor (here’s how to DIY Liquid Watercolor), which I always have lying around. It’s a staple here! Just put a squirt of it into the hair gel and stir. You can use any proportions for this discovery bottle! I used a small container of water beads from the dollar store, and then I added the gel. It was about 2 parts hair gel to 1 part water beads. Mine looks very “gooey,” but if you want it to look more “bubbly,” just increase the amount of water beads. Definitely leave space in the bottle for it to move around. Play to Learn Preschool made these in rainbow colors, and they used more water beads than I did, and you can see how gorgeous that turned out here. 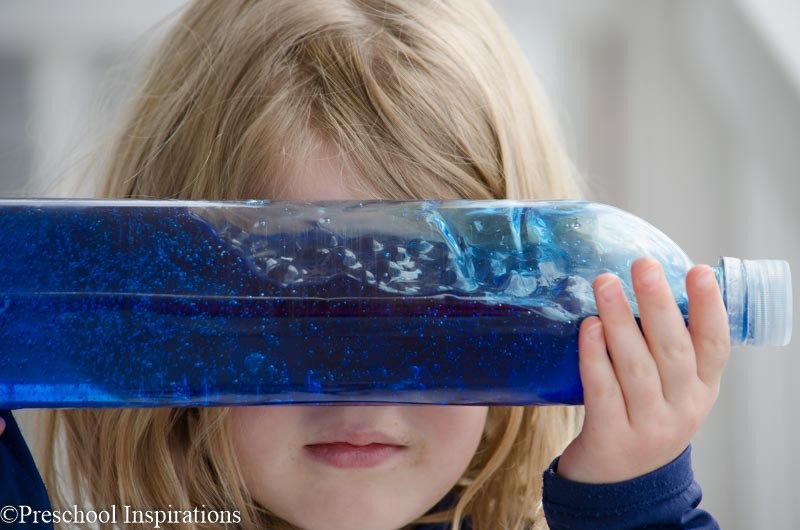 I absolutely love this sensory bottle, and I have a few more ideas I’m going to try with it too. Now there are even more awesome and affordable discovery bottles you can make. 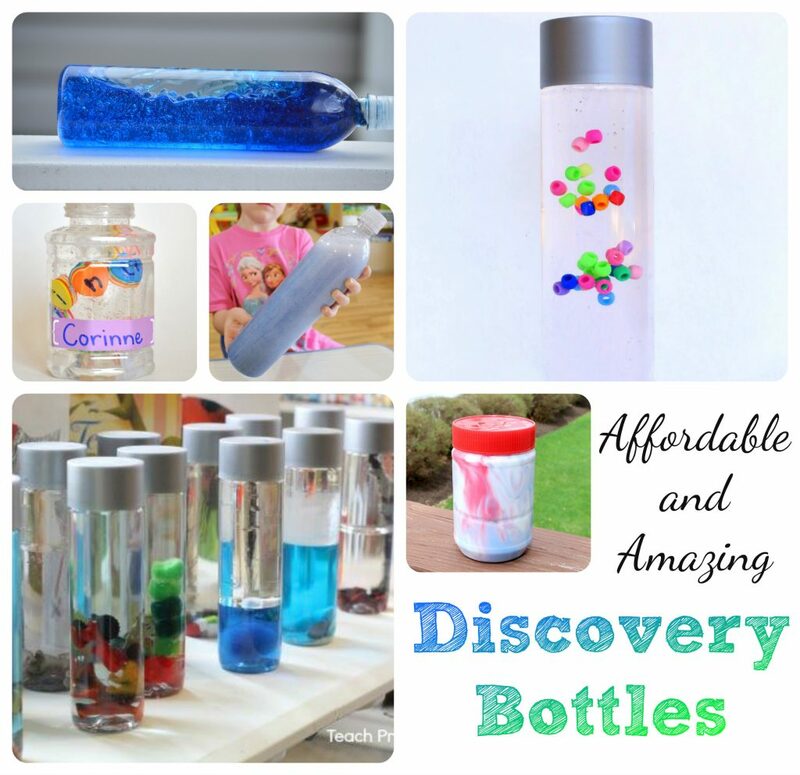 Visit one of the fantastic kid bloggers below to find out how they made their discovery bottle on a budget! What a brilliant idea! Trying this in LOTS of colors! Thanks, Devany! That sounds gorgeous!! I like genius ;). Yes, it is a perfect way to explore water beads without worrying about the safety aspect (as long as you glue the lid on)! I hope your class loves them! 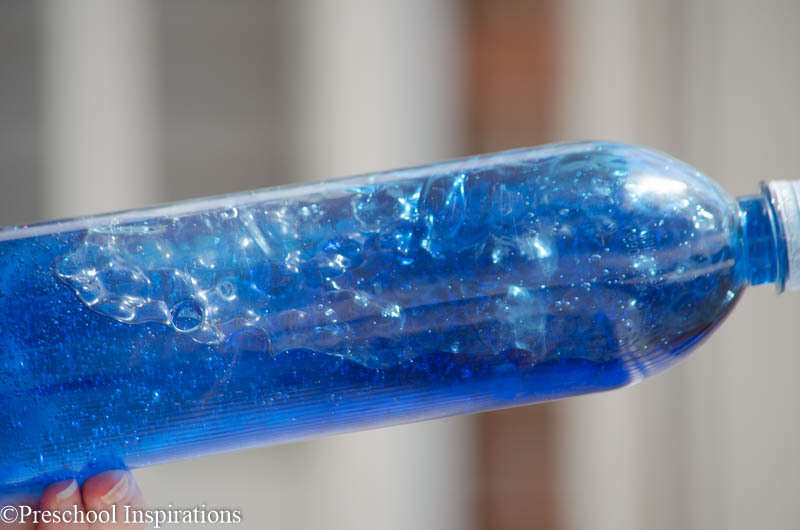 Are these the water beads that expand in water, and do you expand them before adding them to the gel? These ones were expanded before I put them in. When I bought them at the dollar store (in the floral section), they were already in water and ready to go. I hope you enjoy these! How much of each did you use? Getting ready to make for my class. Thanks! 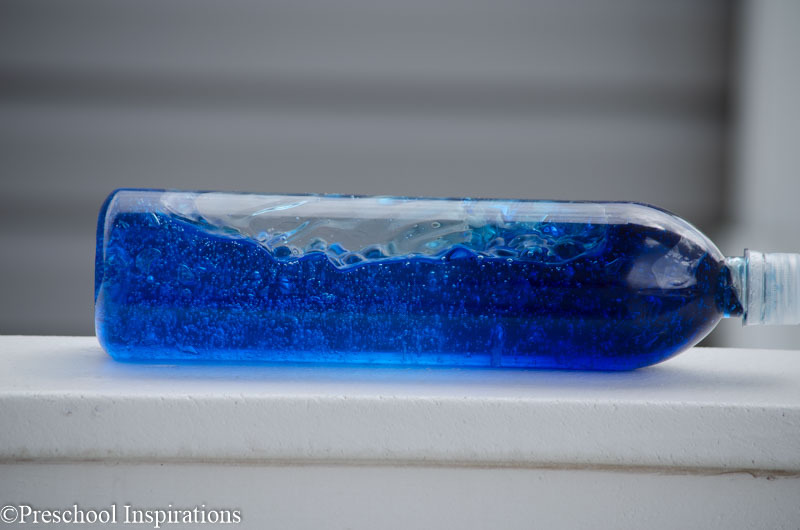 I would say that half of the bottle is hair gel, and then add enough water beads so that the entire bottle is 2/3 full. You want to make sure to leave some empty space. Enjoy! Rena, I used hair gel from the dollar store. I would try and add some water. Your hair gel sounds ultra strong, so you just need to weaken it a bit. Good luck! I bought some water beads for this project. However, I got the kind that is not already absorbed. Can I still use those? If so, do I need to let them absorb in water before I add them to the gel? Or let them absorb in the gel? Thanks! Hi Betsy! I would probably let them expand before putting them in, but I’ve not tried otherwise. Just put them in water for a few hours :). I hope this helps! Hi, I’m in the UK. What bottles have you used please?